We’ve got exciting news to share about chimps that you helped make possible! 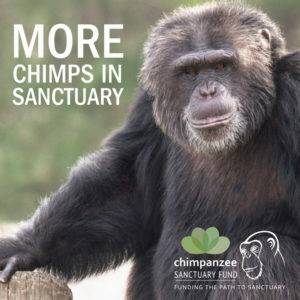 On November 7th, The New York Times published another story in their ongoing coverage of ending the use of chimps in invasive research in the US and getting the surviving chimps to sanctuary. Read it here (and check out earlier stories from 2010, 2013, and 2015 if you missed them). Thank you for helping these chimps and the chimps who will move later this year, with grant support from our Chimpanzee Sanctuary Fund. We must keep going and thanks to you, we will. Please visit us on social media and watch and share our video.